Planets, Print and laminate. Sit in a circle with the group. When you show them the sun, children stand up, dance, and wiggle. (Open sun and moon) Print and laminate. Sit in a circle with the group. When you show them the sun, children stand up, dance, and wiggle. When you show them the moon, they lie down on the floor and pretend to sleep. Alternate the sun and moon. End with the moon to help children calm down. Continue your discussion. Here is a great idea to create a thematic bin. Use a cardboard box covered with pictures. Recycling bins or plastic storage containers are other options. This is ideal to store various items related to the theme. You may use the illustrations from our picture game to decorate your bin. astronaut figurines, puzzles related to the theme, space station, moon, flashlight, rocket, space storybooks, planet illustrations, space shuttle, movies about space, glow in the dark stars or planets, gray, brown, or white modeling dough, cotton balls, planet tattoos, dark blanket, laminated planet illustrations with perforated contours for lacing, empty paper towel rolls with crepe paper to create rockets, different sizes of balls, etc. 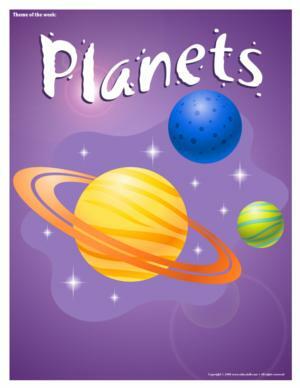 Have fun with these wonderful planet workshop ideas provided by Caroline Allard. Cover the area with space-like materials. Part of a solar blanket, a camping mattress, or an aluminum car mat are terrific. Add Styrofoam balls for space constructions. Space-colored beads can be used to create special bracelets are anti-alien necklaces. The pictures may be used as a memory game or to spark a conversation with the group. Use them to decorate the daycare or a specific thematic corner. 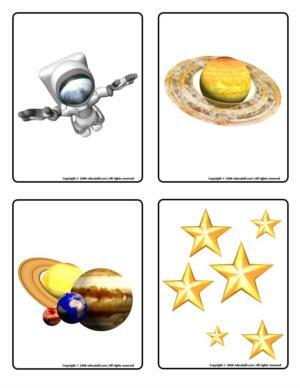 (Open picture game - Planets) Print, laminate, and store in a "Ziploc" bag or in your thematic bins. Print the different planets (Open Planets). Laminate them and deposit them here and there on the floor. Play music. When the music stops, children must jump onto a planet. This game is a variation of musical chairs. Give each child a balloon. Have them draw an astronaut face on their balloon. Children can throw their balloon into the air and watch it float like an astronaut. Explain gravity in space. Create an obstacle course using hoola hoops, chairs, etc. Show children how astronauts walk on the moon. They must go about the obstacle course moving as if they are weightless. Remind them they are no longer children, they are astronauts! Print, cut out, and laminate the pictures. (Open story and memory game - Space) Place the cards face down on the floor. Children pick three cards and invent a story in relation to the illustrations. Variation: Print the pictures twice and use as a memory game. Turn all the lights off. Invite children to move about the daycare with flashlights. They can create constellations by shining their flashlights on the wall. Use three or four cardboard boxes or one large appliance box. Have children paint the boxes grey. Place a small table inside. Add an old computer keyboard, it will represent the spaceship's controls. Wrap a bicycle helmet with aluminum paper. Also place old headphones inside. Provide children with a variety of materials they can use to create an alien costume. Aluminum paper, buttons, felt, sparkles, and pipe cleaners are perfect. 3...2...1...blast off! Children choose a planet (represented by hoola hoops or illustrations) and go to it. Give a child a star (ball) and have him name a planet and throw the star towards that planet. Create a collective painting on a large sheet of paper. Have the group paint their very own solar system. Make sure they include the sun, the moon, stars, and planets. Once dry, glue their solar system to the ceiling directly above their naptime area. Crumple brown tissue paper to create lots of tiny balls. Children throw them everywhere in the daycare, it's a meteorite shower! Collect several different sizes of Styrofoam balls. Paint them and thread a piece of yarn into each ball. Tie them to a hanger. Photocopy and laminate pictures of the different planets. Display them on the walls of the daycare. Begin the activity by telling the group you are lost in space. Name or describe which planet you are looking for. Children fly over to the correct planet as if they were rockets. Visit each planet until you return home, to Earth. (Open Moon with holes) Cut the moon out of yellow construction paper. 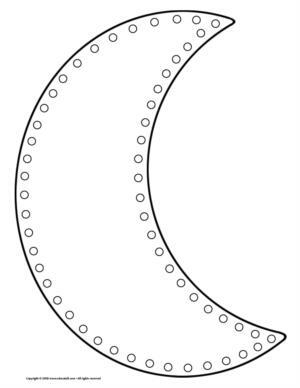 Perforate the contour using a hole-punch. Have children thread a piece of yarn into each hole. Invent a story telling children how an astronaut gave you the recipe for moon water. Use a pitcher ¾ full of water and lemon quarters. Stir and serve at snack time. Give each child a banana at snack time. Have them keep the banana peel and use it to shape a star or a moon. Invite children to taste a variety of dried fruit. Explain that astronauts cannot eat the same foods we eat. Their food must be as light as possible. Paint planets on Styrofoam balls and hang them from the ceiling. Glue a large piece of dark blue construction paper to a plank. As a group, add planets, stars, cotton balls to represent clouds, etc. Styrofoam balls which have been cut in half and painted are ideal for planets. Provide metal cans, empty toilet paper rolls, aluminum paper, and other materials children can use to make robots. You can attach their pieces together with hot glue. (Open stencils - Space) Cut the shapes out of heavy cardboard using an "Exacto" knife so the center is empty. Children can use sponges to make prints on paper with paint. Have children cut out a star shape. Have them cover the shape with aluminum paper. Hang the stars throughout the daycare. (Open creative drawing - My home seen from space) Print for each child. Children draw their home so astronauts can see it from outer space. Children each build their own rocket to fly to outer space. Give them empty toilet paper rolls. Have them cover them with aluminum paper or any other metallic paper you may have. Add orange construction paper to represent flames at the rockets' base. Use empty paper towel or wrapping paper rolls. 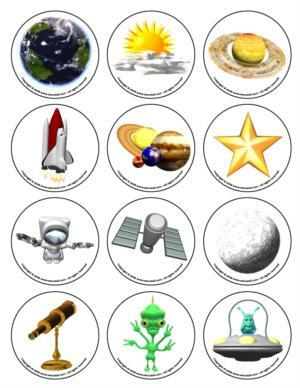 Provide children with various materials they may use to decorate their telescope. Glue star stickers throughout the daycare. Ask children to find them looking through their telescopes. 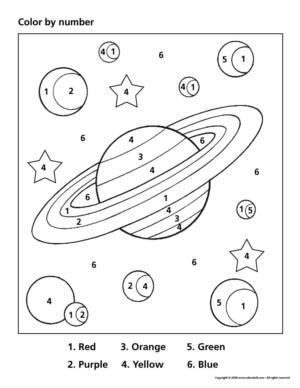 (Open coloring pages theme - Planets) Print. Johanne Arsenault has provided suggestions for an entire week of fun activities. 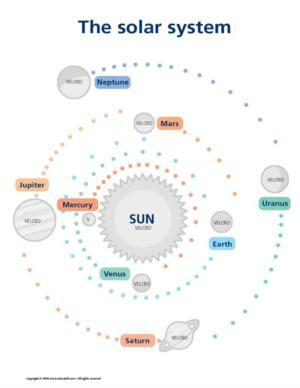 (Open solar system) Print. The Solar Village is a small village, very high in the sky. An old lady called Milky Way lives there with Mr. Sun and his nine baby planets. They are all round and colorful. Their favorite game to play is spin around dad, Mr. Sun. Mercury is not very big, but he is very fast. He is the oldest planet. He likes to stay near his dad who helps him stay warm. He also enjoys being rocked in his Grandma Milky Way's arms. Venus is the family's second planet. She is so beautiful. Many say she looks like a sparkling jewel made of pure gold. She is as explosive as a volcano, but also very warm and kind. Her head is often in the clouds and she tends to do things backwards. The third planet's name is Earth. Earth is of a robust and well-balanced nature. Her dad, Mr. Sun, considers her to be his special planet. Earth appreciates life and never misses a chance to play with her friend Moon. Moon has always protected her. Earth is a beautiful shade of blue, just like Milky Way's eyes. Mars is smaller than Venus and Earth, yet bigger than Mercury. She is the fourth planet in the family. Mars is always red with anger. She does not like to play with others. She prefers to be left alone. Jupiter is the biggest of all the planets. He loves to roll around in the dirt with his friends. Because of this pastime, he always bears brown and white stripes. The sixth planet is Saturn. He is blessed with great beauty. He can easily be recognized by the two yellow luminous rings which surround him. Very warm, he loves being surrounded by friends. Uranus, the seventh planet is handicapped. He had an accident in the Solar Village. With the help of his friend Mr. Wind, he constantly turns around his dad. His body is covered with bluish green which gives him a gentle look. Neptune has plenty of energy but is capable of being discreet and calm. She loves frequent and rapid changes. Her favorite color is light blue. The last member of the family is Pluto. He is the smallest and most fragile of the planets. He is always cold. Mr. Sun sent him to live with his grandmother, Milky Way, to help him gain strength. Mr. Sun, Mrs. Milky Way, and the nine planets need your help. They would like to visit their cousins, the Galaxians, whom they have never seen. How could they possibly get there? Do you have any ideas? What do you think Galaxians look like? Would you like to help organize the planet family's trip to see the Galaxians? Tell the Solar Village story to your group. Invite them to find answers to the questions at the end. How many planets live in the Solar Village? What are their names? Do they have friends? Are they all the same color? Are they all the same size? Who is the smallest? Who is the biggest? How can we help Mr. Sun and Mrs. Milky Way go on their trip? As a group, build a giant space shuttle with building blocks or empty yogurt containers. Keep in mind the planets are all round. Talk about the different planets living in the Solar Village once again. What do they look like? Are they all the same color? Are they all the same size? What does the dad, Mr. Sun, look like? If possible, find illustrations of each planet. Create your own Solar Village with modeling dough. Blow up balloons and pretend they are planets. Children throw them up in the air to the sound of special space music. Which means of transportation did the planets choose for their trip to visit the Galaxians? 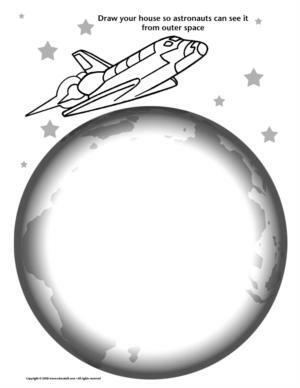 A spaceship which floats, a super fast rocket, or a special airplane which flies like a bird? Have children describe their choice. Children will have fun pretending to fly their creations. Why not take this activity outdoors if the weather is nice? I wonder what these Galaxians look like. Are they round, square, triangular, etc.? Use this discussion to review shapes. Are they bright like stars? Do you think they each have different shapes and sizes? Provide children with several paper shapes and a sheet of construction paper. Have them use the shapes to invent their Galaxian. Older children can cut out their shapes on their own. Encourage children to color their Galaxian. Why not add sparkles too? Children become Galaxians. Have them roll, walk, dance, and eat like Galaxians would. Each Galaxian may have a different way of moving. Each child can show the group his original moves. Ask children if they are glad to know about the Galaxians. Tell them that we live on one of the planets, Earth. We are part of the great Solar Village. Help children admire the wonders of our planet. Go outside and show them that on Earth, we find humans, animals, trees, flowers, grass, snow, ice, etc. For the duration of this theme, your reading corner could be moved under a table covered with a blanket. Decorate the underside of the table with glow in the dark stars. Let children enjoy books with a flashlight. You may also make a rocket out of a large box. Children will look forward to visiting the reading rocket!